Inspired by the flavors of Asia, this panko crusted salmon from Food for the Fresh is a quick meal for any night of the week. A wild salmon filet is soaked in marinade composed of soy sauce, rice wine vinegar, ginger and more. Before being roasted in the oven, the salmon is coated in a panko (Japanese bread crumbs) and sesame seeds. Panko can be purchased in a grocery store or your local Asian market. 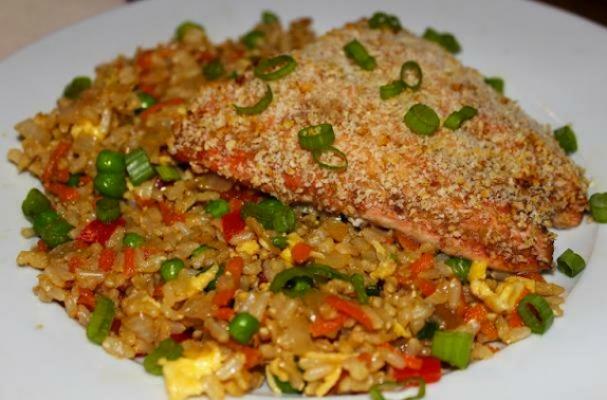 Serve this salmon with fried rice and cucumber salad. Preheat oven to 450F (my personal favorite salmon-cooking temperature). Take your salmon out of the bag, and shake off any excess garlic pieces that may be clinging to the salmon. Sprinkle sesame seeds over the salmon (they provide a more toasty flavor if you like that). Pat Panko into the top of the salmon, and shake off excess crumbs. I baked my salmon for 8 minutes (1/2 pound piece). Adjust time up or down depending on whether your pieces are larger or smaller. Salmon often gets overcooked, so check it sooner than later! If it's a little under, you can always wrap it in foil for 10-15 minutes to continue cooking. Rest salmon for about 10 minutes before serving, and then you have a beautiful piece of salmon to dig into.